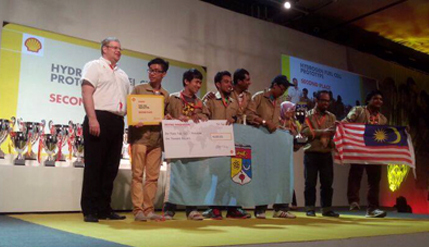 BANGI, 9 Feb 2014 – The National University of Malaysia’s (UKM) Fuel Cell Institute emerged runners up in the vehicles running on alternative energy sources at the Shell Eco-Marathon Asia 2014 competition ending in Manila today. The Fuel Cell Institute team, led by Dr Masli Irwan Rosli and Dr Teuku Husaini of the Engineering and Built Environment Faculty, took second place in the Hydrogen Fuel Cell Prototype category in the final run today. The prototype vehicle, dubbed UKM 2, achieved a maximum distance of 52.09 km per kWh. First prize in the same category went to another Malaysian institution – Universiti Teknologi MARA (UiTM) with its UiTM Eco-Sprint vehicle which reached a distance of 76.00 km per kWh. Four other cars in the same category, including an entry from Universiti Malaya, did not manage to cover any measurable distance. The Shell Eco-marathon Asia 2014 was held for the first time in Manila, Philippines, from February 6 until today. Over 100 cars in various shapes and sizes took part in the competition held on the street circuit at Luneta Park in Manila. The cars were built by students from across Asia and the Middle East in an attempt to set a new record and achieve the highest mileage on a litre of fuel. This year, a total of 68 Prototype and 37 Urban Concept entries vyed to set a new record in an urban race track – the first time the competition was brought to the city streets. The vehicle entries used a range of energy sources: hydrogen fuel cell, battery electric, gasoline, diesel, Shell Gas to Liquids (GTL), Fatty acid methyl ester (FAME) and Ethanol E100. Student teams participated in one or both of the Prototype and UrbanConcept categories of the competition. A fuel cell is a device that converts the chemical energy from a fuel into electricity through a chemical reaction with oxygen or another oxidising agent. Hydrogen is the most common fuel, but hydrocarbons such as natural gas and alcohols like methanol are sometimes used. Fuel cell car engines do not emit any polluting emissions or smoke. The Fuel Cell Institute (Institut Sel Fuel) was set up in 2007 and is the first research institute in Malaysia conducting research on fuel cell and hydrogen energy.